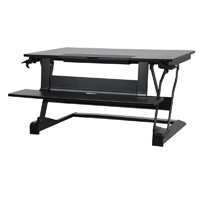 The WorkFit-S clamps on to the front edge of your desk and uses the Ergotron's Constant Force spring lift mechanism to assist in moving the keyboard tray and monitor through the range of motion. 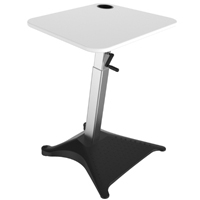 The vertical adjustment range is 18", and the monitor mount independently can vertically adjust an additional 5". 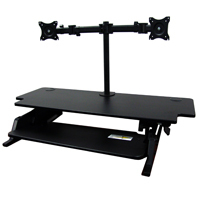 The desk edge must be between .47" and 2.4" thick for the clamp to function, and the monitor must be between 16 and 28 lbs for the LCD pivot to function correctly. The keyboard tray is 16.5" wide x 9.3" deep, and the slide-out mousing surface is 7.5" wide x 7.9" deep, and the maximum weight on the keyboard surface cannot exceed 3 lbs. 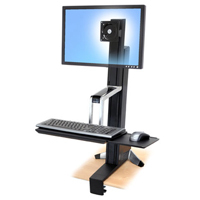 The WorkFit-S Dual Sit-Stand Workstation clamps on to the front edge of the desk and uses the Ergotron's Constant Force spring lift mechanism to assist in moving the keyboard tray and monitors through the range of motion. 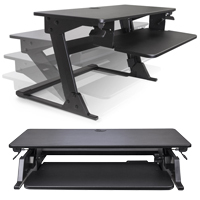 The vertical adjustment range is 18", and the monitor mounts (in tandem) can independently vertically adjust an additional 5". 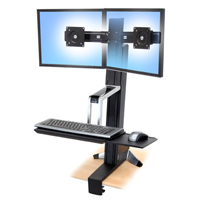 The desk edge must be between .47" and 2.4" thick for the clamp to function, and the monitor must be between 6 and 14 lbs for each monitor for the LCD pivot to function correctly. 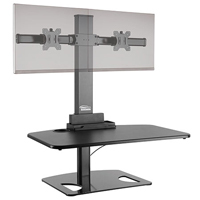 In addition, the maximum width of each monitor cannot exceed 21.25" (for the LCDs to be able to mount on the Workfit). The keyboard tray is 16.5" wide x 9.3" deep, and the slide-out mousing surface is 7.5" wide x 7.9" deep, and the maximum weight on the keyboard surface cannot exceed 3 lbs.